Voyages dans la basse et la haute Egypte, pendant les campagnes de Bonaparte, en 1798 et 1799. London: S. Bagster for J. and W. Smith, 1807. Baron Dominique Vivant Denon was an artist and archaeologist who accompanied the Napoleonic invasion of Egypt in 1798. 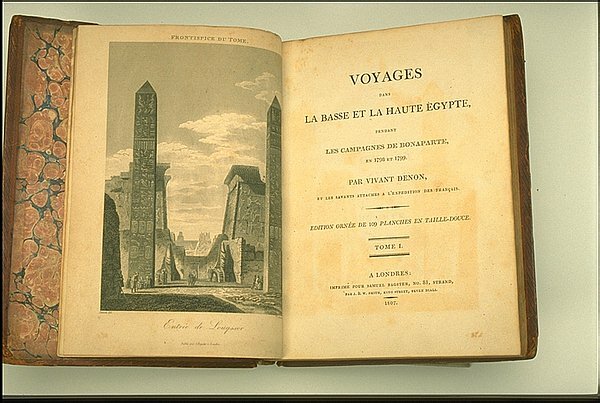 He published his account of Egyptian geography, history, and monuments in 1802, and the work immediately gained such popularity that it was reprinted in both French and English. The frontispiece shows the entrance to the Temple of Luxor flanked by two, pink granite obelisks with hieroglyphs. Denon's intended scientific accuracy is revealed in his meticulous observations, but the human figures (added for scale), lighting, and dramatic perspective added a touch of the exotic. Books such as these brought the history of far-away lands to Europe. Today they provide an early description and visual record of antiquities which have been lamentably altered or which no longer exist. Such is the case with the Temple of Luxor. By 1836, the site had been ransacked and one of the obelisks had been carted off to Paris to be erected in the Place de la Concorde.